The Buffalo Soldiers’ Online Museum, founded by Major Andrew Aaron Jr., informs, unites, and educates the general public on the history of The Buffalo Soldiers. The Buffalo Soldiers was a regiment of the United States Army commissioned in 1866 and decommissioned in 1951 and focused on the individual histories of these men of valor. Our online museum provides a tour, video and pictures, as well as, a personal bibliography of Major Andrew Aaron, Jr. His vision includes establishing a brick and mortar museum in Southern California highlighting the multi-cultural heritage of many ethnic groups and their contributions to our society. Trooper Aaron retired from the Army as a Major, with over 30 years of military service, including service during the Vietnam War. He has held the office of President of the Los Angeles Chapter of the 9th & 10th (Horse) Calvary Association. 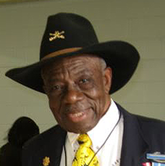 He is the founder of the Buffalo Soldiers Online Museum. The nickname buffalo soldiers began with the Cheyenne warriors in 1867. The actual Cheyenne translation was Wild Buffalo. The nickname was given out of respect and the fierce fighting ability of the 10th cavalry. Overtime, Buffalo Soldiers became a generic term for all African American soldiers. To preserve history and inform you of the current events of the Buffalo Soldiers Online Museum in Los Angeles. Leveraging our past legacy, developing the present to impact the future.